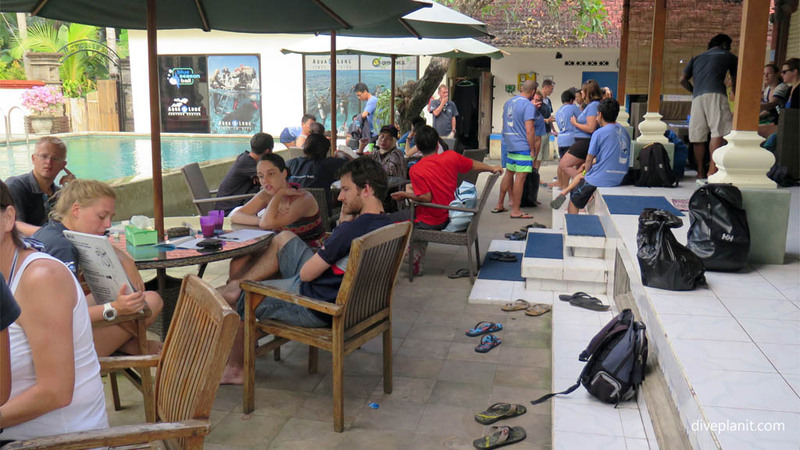 Blue Season Bali is a 5 Star PADI Career Development Centre (CDC) – the highest PADI rating in terms of dive instruction. 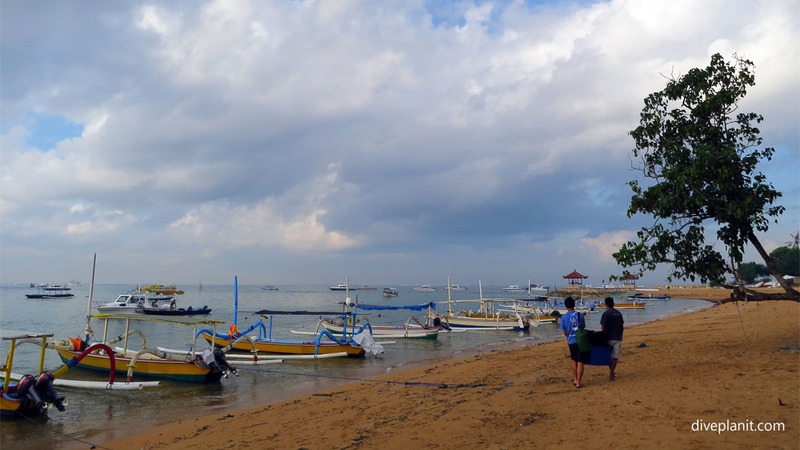 They have a facility in Sanur with a large pool, classrooms, and R&R areas, plus two minibuses, a gear truck and two boats moored nearby. 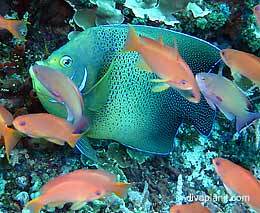 They are also the dive operator for the Menjangan Resort in the far north west of Bali. 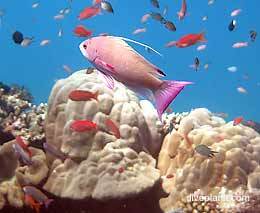 They are able to arrange diving all around Bali: from Nusa Penida and Nusa Lembongan, around the east coast from Pedang Bai right up to Kubu, and on the north western coast. 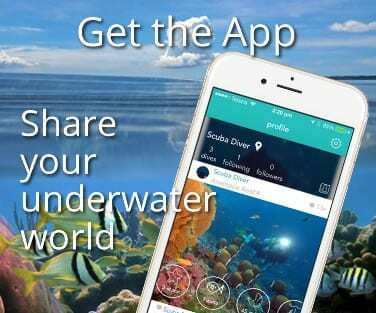 This will include the diving, accommodation, all transfers and any fees or permits required. 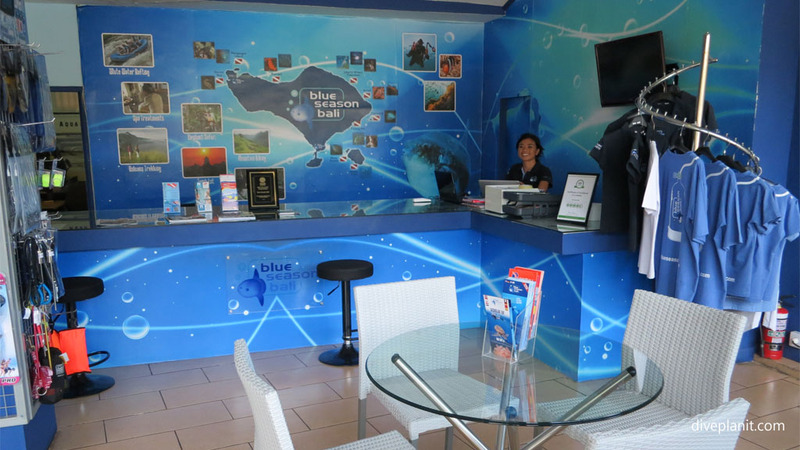 Blue Season have a retail shop on Jalan Danau Poso in Sanur where you can buy gear, and make bookings for all the diving around Bali. 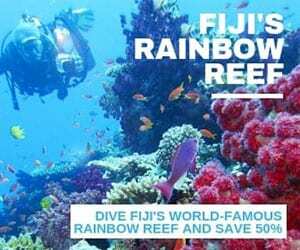 At their facility, they have all the gear you might ever need to hire and can cater for over 100 divers per day in 7 languages. 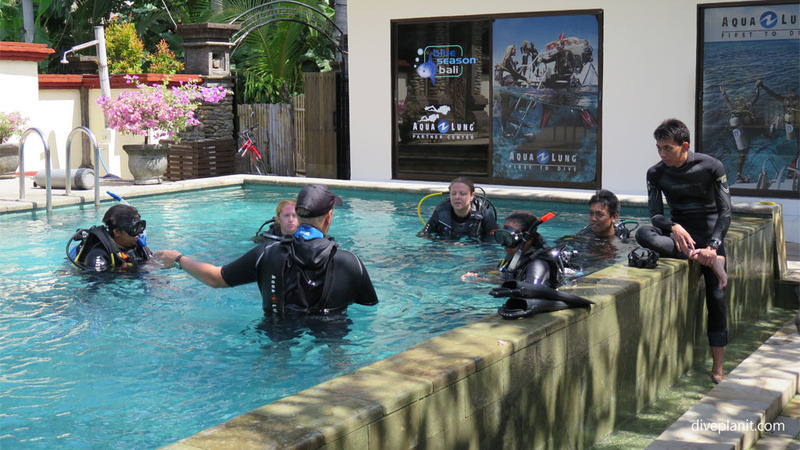 They offer courses from Discover Scuba Diving (DSD), right up to Dive Master Internships – and everything in-between. The Blue Season facility is at Jalan Danau Poso, Gang Wanasari 3B, Sanur. They also have a booking Kiosk in down town Sanur on Jalan Danau Tamblingan (opposite Hardy’s). Contact them directly on 0361 270 852 or info@blueseasonbali.com. 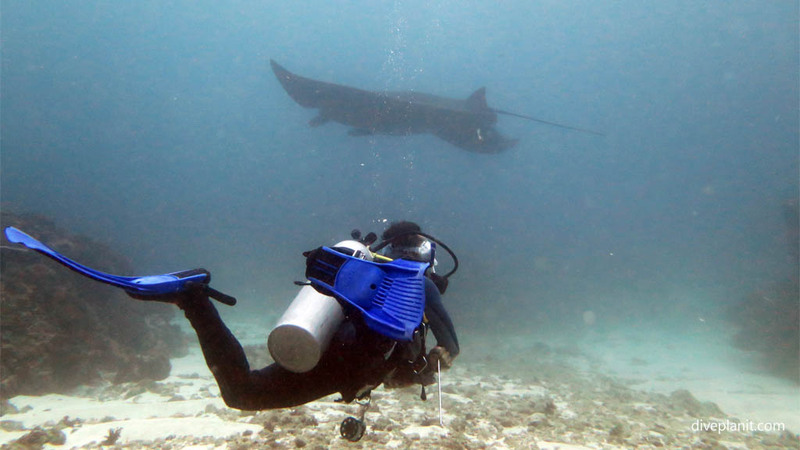 We did the three dive Nusa Penida boat trip with Blue Season which includes one of the Manta Points, Crystal Bay (unfortunately it was not Mola Mola season), and Lembongan. 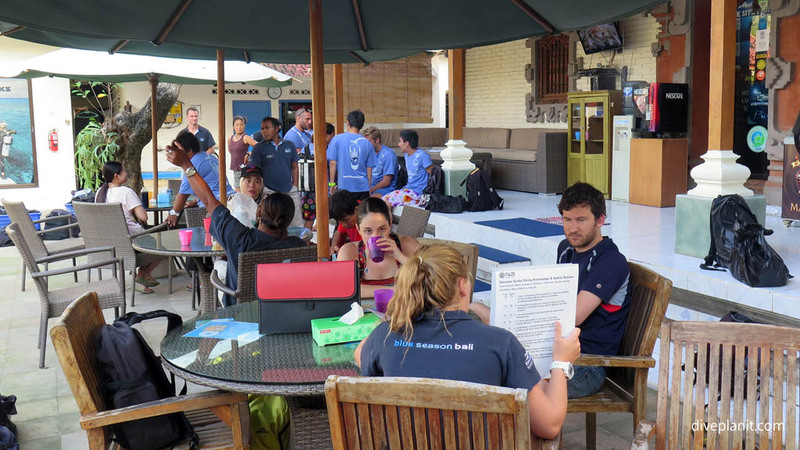 Guests arrive at the dive centre sufficiently before 8am to get organised for the dive. 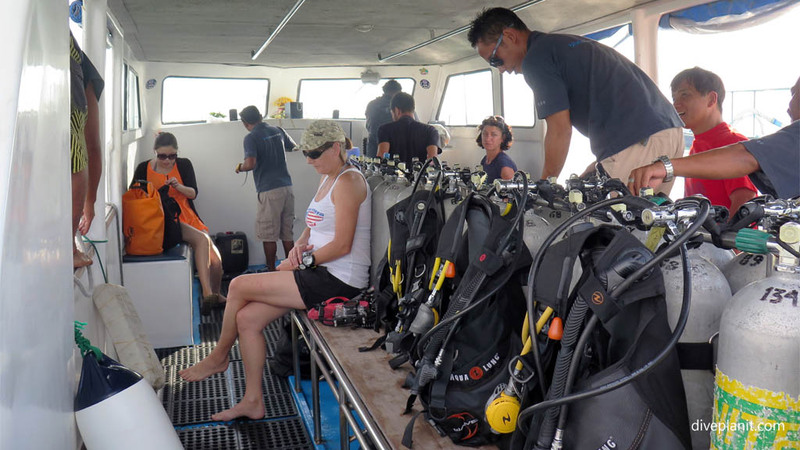 The paperwork includes a reminder that the reefs are fragile and the good diving practices that need to be followed to ensure their continued good condition. There is tea and coffee available. We were kitted out with a full length 3mm suit and bootees. Though I would recommend, if you have one to take an additional shark skin if you plan to dive around shark point – the water temperature there is around 21°C. Once you’ve tried on everything for size, all the gear is loaded into a named crate for you and magically reappears on your boat strapped to a tank, or lying at the foot of it. For the trip out to Nusa Penida, the minibus departs about five to eight for the five minute run to the beach. Depending on the tide it might be a short walk out to the boat, or short ride in the tender. There is stowage on the boat for dry gear and wet gear, though as lunch, water, and towels are all provided there’s not much you would need to take on board except perhaps sunnies, a hat and your camera. 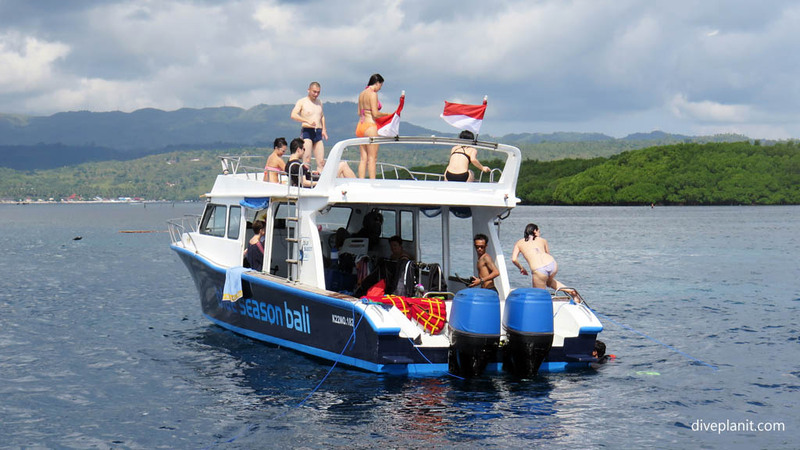 Both boats are custom built for diving and have a cabin area up front where you can remain dry, a stern, where you may cop some spray on the way out to Nusa Penida, but will be assured of plenty of fresh air, and a ‘sun deck’ on the forward roof, or bow area where you can catch a few rays between dives. The trip out to Nusa Penida is about 45 mins and the sea state can vary from ‘glassy’ to ‘choppy’ – within the same trip – and even a few of each within the same trip. If you’re the slightest bit prone to seasickness take medication as soon as you arrive for check-in. 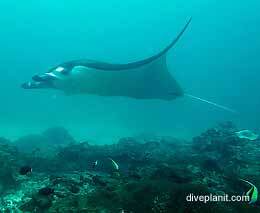 Once out at the dive sites, each appears to be in a very sheltered bay, so you’ll be fine once you get there. There are a number of boats from a number of operators and they occupy moorings which are maintained by the islanders. 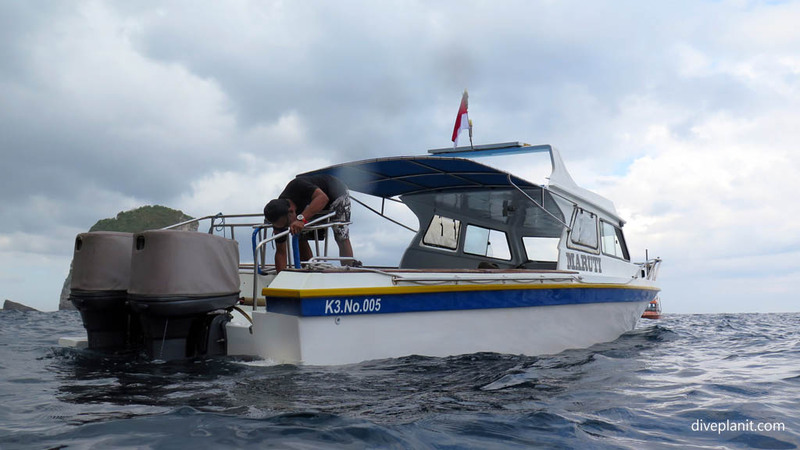 A local representative comes around the dive boats to collect the $1.50 per boat per day, which hopefully is ploughed back into the community coffers of the 5,000 or so people who inhabit the three closely knit islands. Whilst we are there we moor alongside the one of the other Blue Season boats which was dedicated to snorkelers that day. 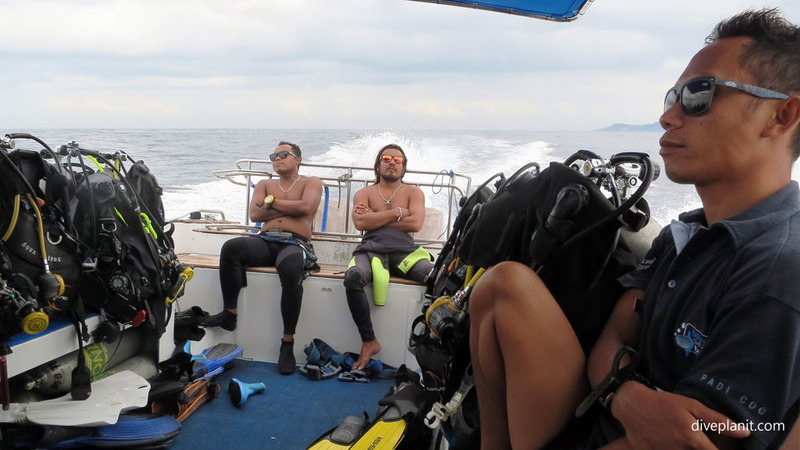 Before each dive, the dive guide runs through the dive plan and protocol: where currents may be, what we’ll do if we encounter them, max depth and time etc. Then it’s time to kit up and go. Entry is via backward roll, and each small group is quickly assembled, despatched and on their way to the bottom without rush or fuss. 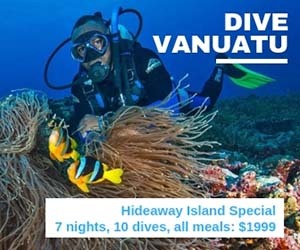 The dive is executed pretty much to plan, and as the group size is usually about three – two guests and a guide – it’s easy to stay together despite the surprisingly large numbers of boats and groups of divers. Once the first member of the team hits 50 bar, the guide takes us up to 5m for a safety stop in free water, typically finning slowly in the direction of the boat. A safety sausage ensures that no boats pass overhead as we’re doing this. On the surface the boat is typically not far away. If it is, we stay put as a group and it comes to us. There is a ladder lowered at the rear, and it’s an easy climb back into the boat once you’ve removed your fins. The boat crew re-organised tanks between dives so you’re free to have a snack, review your photos or just enjoy being there. Lunch is served between dives two and three; there’s a choice of local or a sandwich – I tend to find in these circumstances that its best to eat local – it might be a simple dish – but they do it well. After the third dive everything, including wetsuits are stowed for the return trip. You can change into dry clothes before the trip back, or just travel back in the towel provided. There are showers both at the beach where we land, and at the dive centre. Again, no need to worry about gear, Blue Season appear to have a small army of sappers who take care of all that. Once back at the centre, you can relax over a coffee, write up your dive, or catch the day’s highlights on the big screen captured by the videographer who was also on the trip.